How many clicks do we spend copying texts from one place to another? 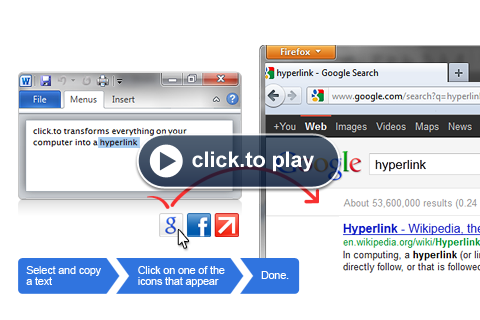 For example for copying a text from a Word document to the Google Search in the browser. Clickto offers you shortcuts whenever you use your Windows clipboard (AKA Ctrl-C). It is running in the background and shows shortcut icons whenever you copy something into your clipboard. 3. Click on one of the icons that appear.